Now you can watch TV on your schedule. The DVR interfaces directly with our Interactive Program Guide. Just set the DVR to record your show and watch it when you have the time to relax and enjoy it. Manage your DVR remotely through the Remote DVR Scheduler. RDVR scheduler allows users to schedule and manage recordings on their Whole Home DVR using their desktop or mobile browsers. 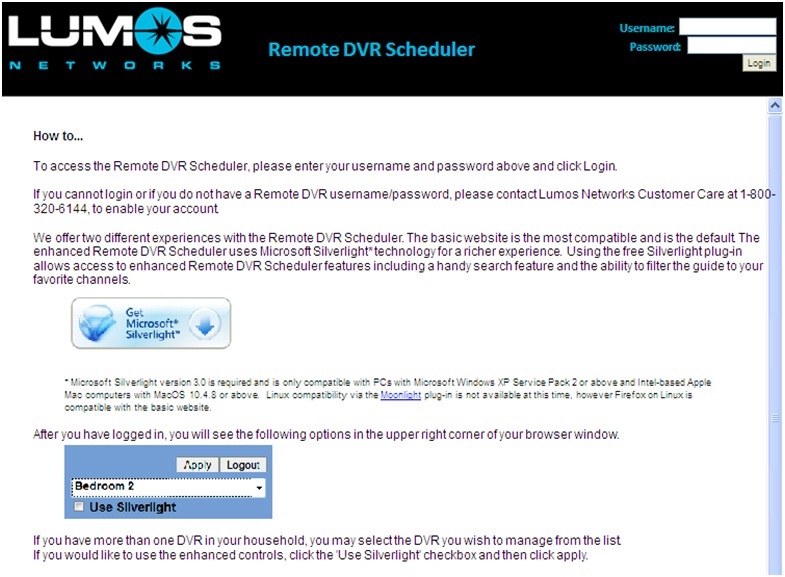 Simply click the “Remote DVR Scheduler” link in the right-hand column or visit https://rdvr.lumos.net to get started. Access to Remote DVR requires a username and password. You may have your current Lumos email passwords enabled for RDVR login or you may setup a separate username and password. Contact Lumos Network’s Video Customer Care at 1-877-468-3567 to enable your preferred username and password. You may also need to download Microsoft’s Silverlight software to view the RDVR website.